Exploring the contribution of women in the Platonic tradition and it message for us today. Women were members of almost every philosophical school and movement in the ancient world, including the Platonic tradition. In fact, individual female philosophers are attested as philosophical students of Plato’s academy and as philosophical teachers and students in the late Platonists schools in late antiquity. 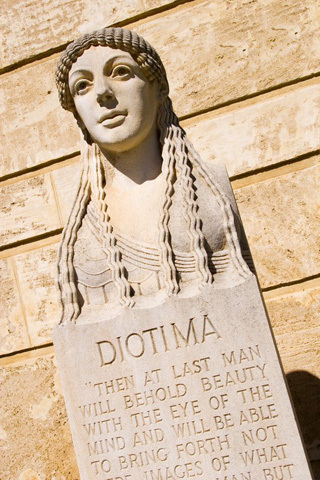 In the Symposium, Plato puts one of his important accounts about the nature of philosophy into the mouth of a woman, Diotima, who is represented as Socrates’ teacher and as a prophetess and priestess, as well as a philosopher. In the Republic, Plato has Socrates argue that natural talents are distributed alike among both genders and that women should be educated, trained and employed in the same fields and disciplines as men – in music, gymnastics and war, as well as in philosophy. We will explore the importance and roles of women philosophers connected with the Platonic tradition, focusing on Axiothea and Lastheneia, female students in Plato’s Academy, Plutarch’s wife Timoxena and his colleague Clea (who was also a priestess), Gemina the Elder and Younger and Amphiclea, female philosophers who were members of Plotinus’ philosophical school, Porphyry’s wife Marcella, Sosipatra, one of the successors of Iamblichus’ philosophical school, and the famous Alexandrian philosopher, Hypatia. Since there are few philosophical works written by women that survive from the ancient world (an important issue in itself which will be discussed), we will explore a range of texts which depict and discuss the lives and works of these female philosophers, reflecting on the significant contributions made to philosophy by these women and the importance of women’s involvement in philosophy more broadly.